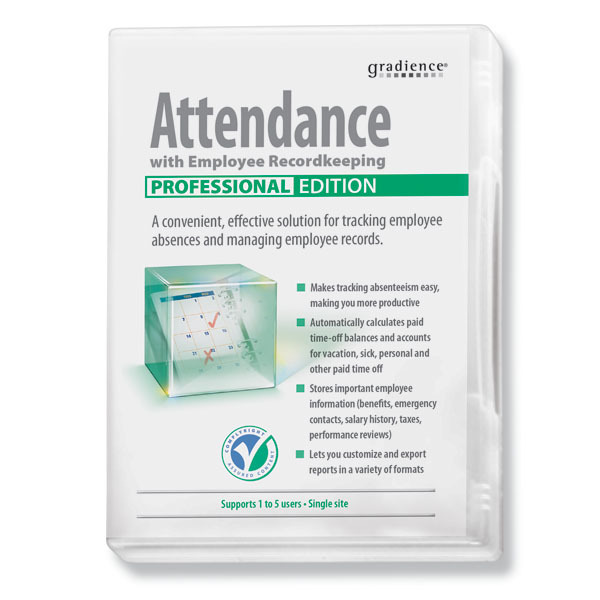 This robust software combines employee attendance tracking and recordkeeping into a single flexible personnel management solution. Automatically calculate time-off balances, vacation, sick, personal and other paid time off. Securely store important employee information: benefits, contacts, salary history, performance reviews and more. You can also customize and export reports in a variety of popular formats. Click "Download Free Trial" (to the right) to try Gradience Attendance FREE for 30 days or watch a flash demo. 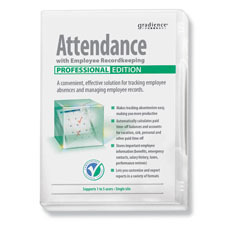 Already using Gradience Attendance software? Renew your license today! Includes SmartUpdate by ComplyRight™, which automatically alerts you when your software needs an update to stay current with new governmental compliance guidelines, rules or laws. Free for the calendar year of your software release. This purchase is for a one year software download license. It requires an annual renewal for use.